New York, NY – October 8, 2012 – On Wednesday October 10th, U.S. Paralympian Rebecca Hart of Unionville, Penn. will be showcased on ABC’s Good Morning America. Hart will accompany Ann Romney, wife of Republican presidential hopeful Mitt Romney, in New York’s Times Square. Mrs. Romney and Rebecca Hart will be speaking about how horses have provided a unique form of therapy for them. Both equestrians will also touch on the 2012 London Paralympics and the equestrian sport. Mrs. Romney will be co-hosting the 8 a.m. (Eastern Time) news hour with George Stephanopoulos on Wednesday where she is filling in for Robin Roberts, who is on extended medical leave. 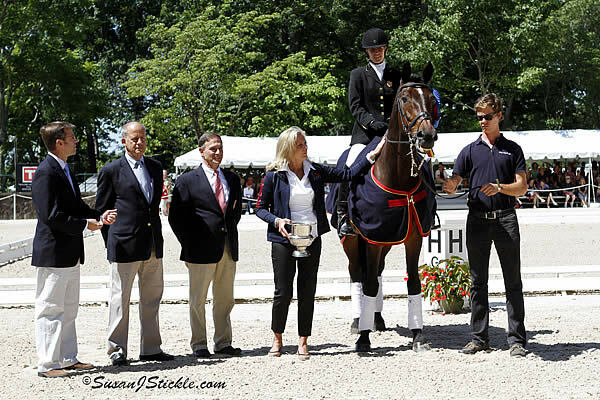 Rebecca Hart, horse Lord Ludger (owned by Jessica Ransehousen), and U.S Parlaympic Chef d’Equipe Missy Ransehousen will present a previously recorded segment from October 8th showcasing the Paralympic Dressage duo at Blue Hill Farm. In addition to Rebecca Hart and Lord Ludger’s Times Square debut, Ann Romney will accompany Hart riding Ireland’s Bronze Medal Team horse, Orlando, owned by James Dwyer.